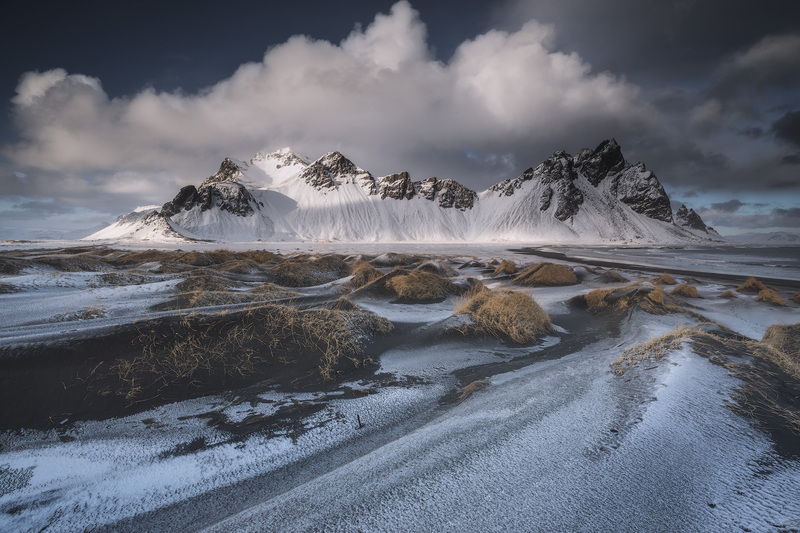 Spend two weeks travelling around the country with award-winning photographers, capturing some of the most beautiful attractions in Icelandic nature on film. Journey around the entire Ring Road in the autumn and visit places like the Snæfellsnes Peninsula, Lake Mývatn, Jökulsárlón glacier lagoon, and Reynisfjara black sand beach. 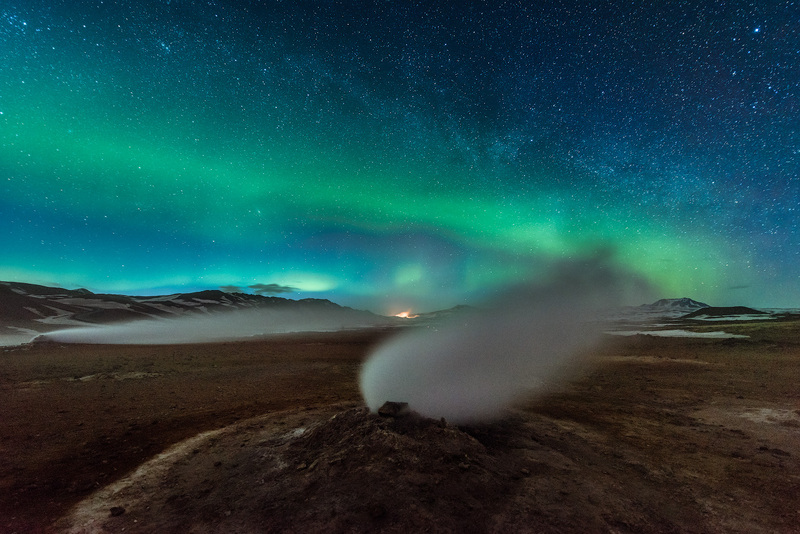 This is the perfect choice for professional and beginner photographers alike, who are looking to develop their skills and portfolio, and see the otherworldly Icelandic nature while it is cloaked in the reds, greens, and yellows of autumn. Both accommodation and transportation will be arranged before your arrival, as well as a dinner you will have on the first day to get to know your photography guides and the rest of the group. 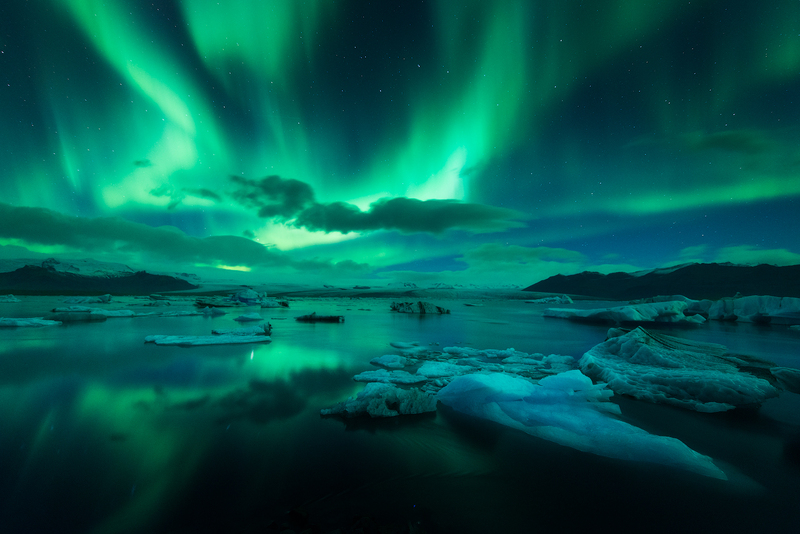 Bring back home stunning photos of Iceland with this fantastic 14-day tour. Check availability by choosing a date. 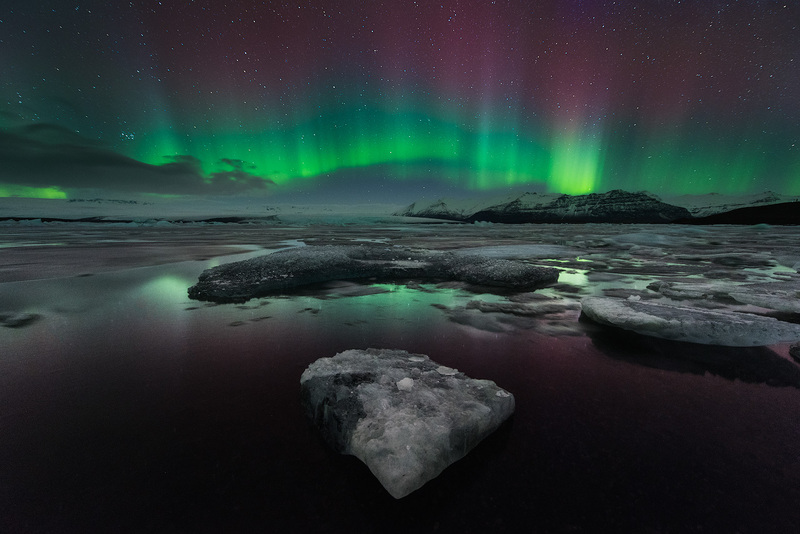 When it comes to the Northern Lights, while they are most likely to be seen between September and April, there is no guarantee that they will appear on a given day. You will arrive at Keflavík International Airport. After collecting your bags, you'll hop aboard a bus that will take you through the moss-covered lava fields of the Reykjanes Peninsula to Iceland’s capital, Reykjavík. Once you have settled into your accommodation, your professional photo guides will pick you up from the lobby and take you out to dinner. Over a lovely meal, you’ll discuss your upcoming adventure, and get to know both the guides and the other participants. Your journey around Iceland starts bright and early on day two. 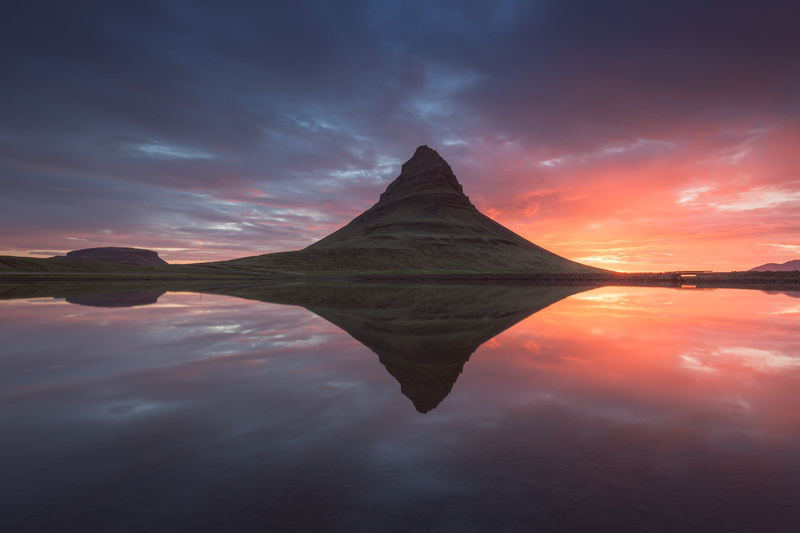 You will be picked up from your hotel in Reykjavík and head on out to the magnificent Snæfellsnes peninsula, where you'll spend two days sightseeing and photographing the beautiful and diverse natural attractions found on this 90 km stretch of land. You’ll start by travelling past Reykjavík’s city mountain Esja, and through the verdant farmlands of West Iceland. Once you reach the peninsula, you will be greeted by vast lava fields, jagged peaks, and the magnificent Snæfellsjökull glacier. Your first stop is the charming fishing village of Arnarstapi. A short hike away is the craggy rock formation of Gataklettur which has been carved into a massive arch by the strong waves of the Atlantic Ocean. When the autumn light hits the surrounding water, it creates a martian atmosphere which your guides will help you capture on film. From there, you’ll move on to the picturesque hamlet, Búðir, where you’ll find a small, solitary church surrounded by nothing but the raw, Icelandic nature. 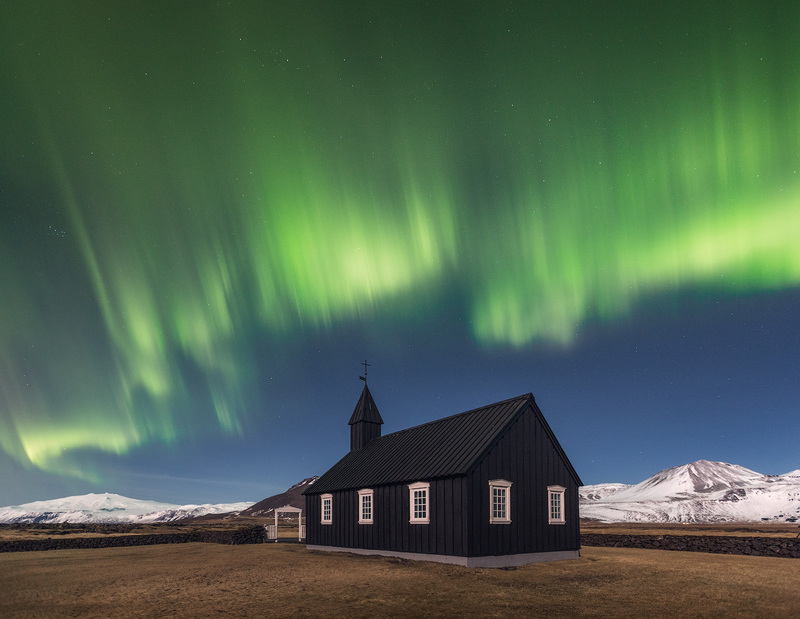 The church’s jet-black colour is in exquisite contrast to the pearly white Snæfellsjökull glacier in the background. You will then spend the night in your accommodations, surrounded by the natural beauty of the Snæfellsnes Peninsula. 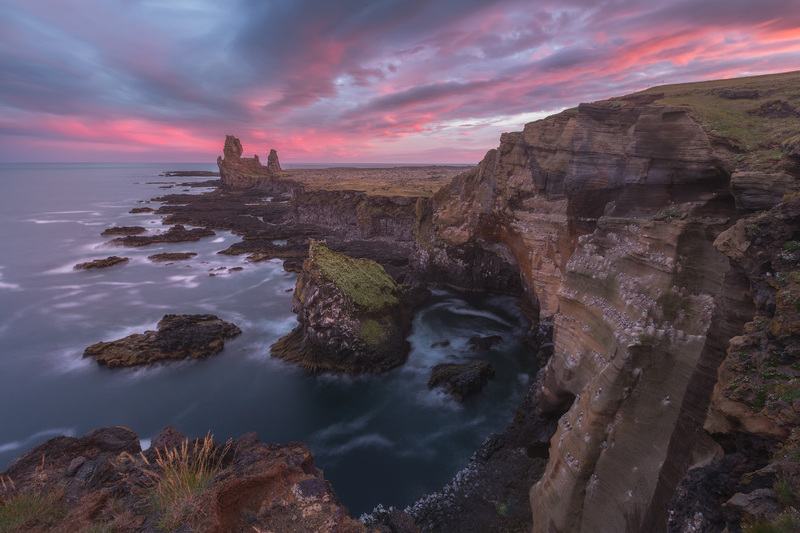 Today, you’ll continue your exploration of the beautiful Snæfellsnes peninsula, and you’ll start the day by heading to its dramatic southern coastline, where you’ll find the massive Lóndrangar rock stacks, rising out of the ocean like the ruins of an ancient castle. Many nesting birds make their home in these giant volcanic pillars; watch the birds fly above you as the ocean waves crash against the razor-sharp rocks below. 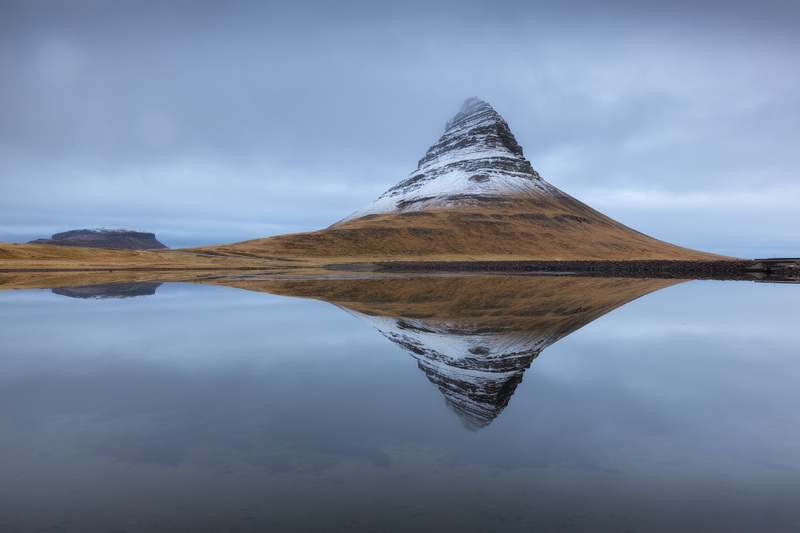 No photography tour of the Snæfellsnes peninsula is complete without a visit to the famous Kirkjufell mountain. The mountain, with its unusual cone shape, is in itself very photogenic, but it is the whole area around that makes this location so spectacular. 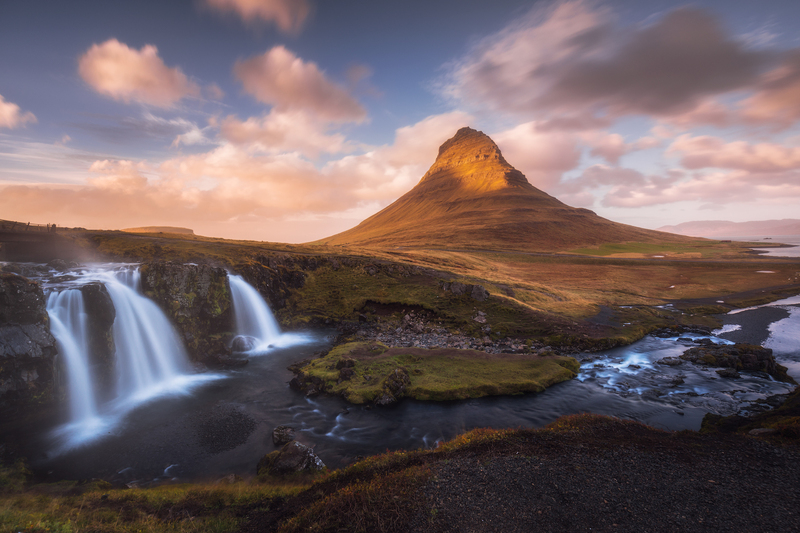 In front of Kirkjufell is a small waterfall but you can also find small streams, black sand, tall grass, and often low-hanging clouds, all great elements for an amazing photograph. If the conditions are right, you might go hunting for the elusive Northern Lights before heading back to your accommodation on the Snæfellsnes Peninsula. Now it's time to head North and to go off the beaten path. 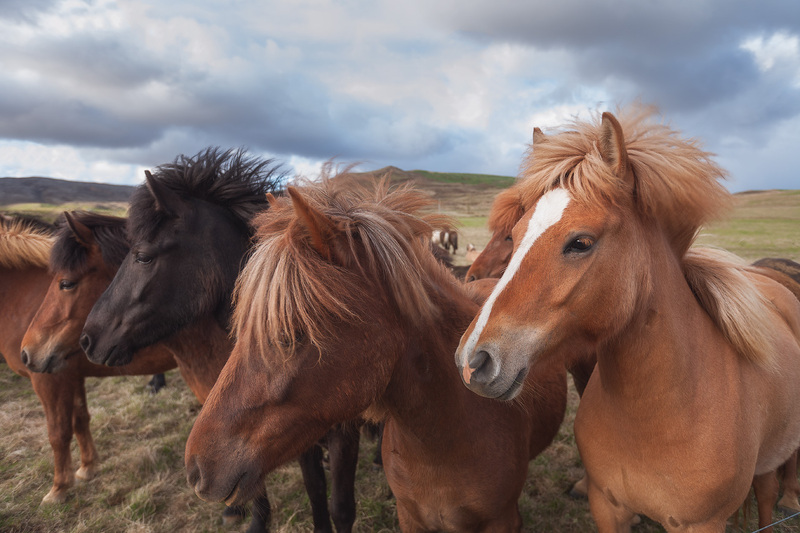 You will travel to a remote corner of the country, the Vatnsnes Peninsula, where expansive farmlands will greet you with craggy hills and grazing horses. This hidden gem is filled with fantastic photo opportunities, from incredible views of the Westfjord’s mountains to the roaring waves of the Atlantic Ocean. However, your focus today will mostly be on the massive rock monolith, Hvítserkur. This basalt formation’s shape recalls a dragon sitting out in the ocean, while others think it looks like an elephant taking a drink. However, it's actually a petrified troll, transformed into stone by the rays of the sun... according to legend at least. 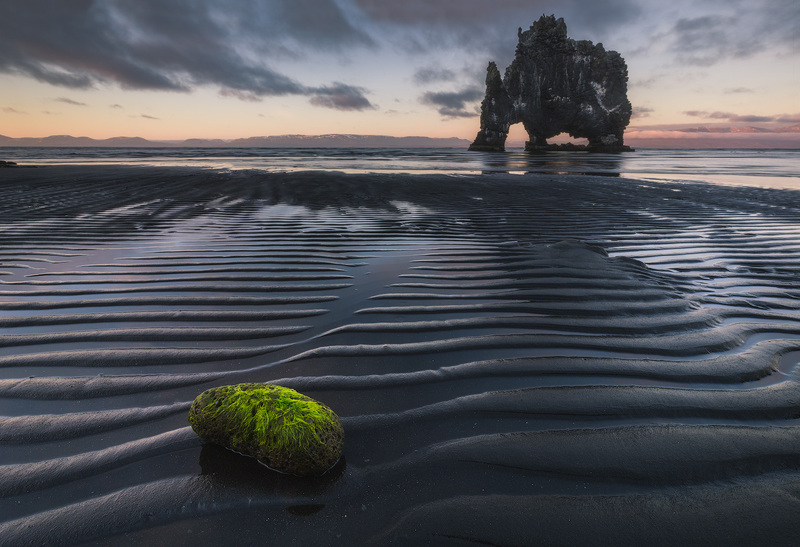 Troll or not, Hvítserkur is an excellent photographic location because its appearance changes depending on what angle you use and how the sun hits it. You might even spot a few seals there, too, because the area is known for its large seal colony. You’ll spend the night at accommodations in the lively town of Akureyri. Today you’ll visit the stunning Lake Mývatn area in Northern Iceland. The whole region is volcanically active because it sits squarely on the Mid-Atlantic Ridge, resulting in a peculiar landscape that you’ll spend the next three days photographing. 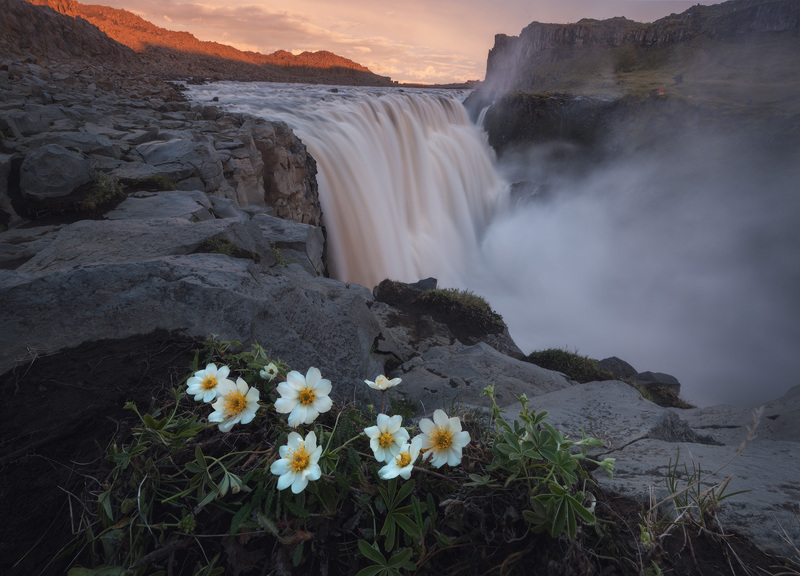 Your first stop, however, is a stunning 30-metre wide cascade just outside the Mývatn area called Goðafoss. The name translates to ‘Waterfall of the Gods’ and you’ll spend the morning capturing its beauty in the emerging light. Mývatn lake is incredibly picturesque, and volcanic formations dominate the whole landscape around it. In the lake are enormous free-standing lava pillars as well as around 40 islands, skerries or pseudocraters which are landforms created by steam explosions over 2,000 years ago. If there is still time, you will head east of the lake, to the dark lava labyrinth of Dimmuborgir for a few quick photos before heading to your accommodations in the area. 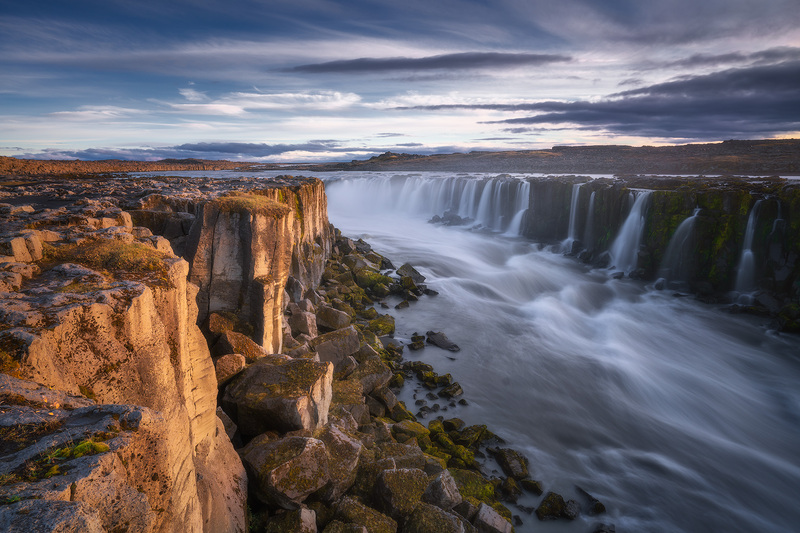 Today, you’ll head into the Highlands to shoot two stunning waterfalls on the Skjálfandafljót river, Aldeyjarfoss, and Hrafnabjargafoss. The former tumbles into a broad basin which is surrounded by impressive basalt column. You’ll try and capture the stark contrast of the dark basalt, the clear water, and the beautiful autumn colours that surround the cascade. Hrafnabjargafoss is embedded into volcanic rock and a large, rocky island is located in the middle of the stream. The torrent of water falls into a small bowl filled with pristine blue water, which will give your photos just a hint of magic. Both waterfalls are fantastic locations to capture the flowing water and to see how the changing sunlight shapes the photograph. After a busy day, you’ll return to your accommodation in the Mývatn area. You’ll continue on your exploration of Lake Mývatn, and today, you’ll travel to the geothermal area near Mt. Námafjall where you’ll find a myriad of colourful hot springs, bubbling mud pools, and hissing fumaroles. This is the perfect place to experiment with contrasts and textures, especially in the light, soft sunlight. You will then visit one of the world’s largest explosion craters, Hverfell. During the age of the Viking settlers, a large eruption took place in a nearby volcano, engulfing the entire crater in lava. There is no better way to end a visit to the Mývatn region than with a stop at the Mývatn Nature Baths. Here, you can unwind and relax in the geothermal pool which overlooks the area you’ve been exploring in the last few days before returning to your accommodations. 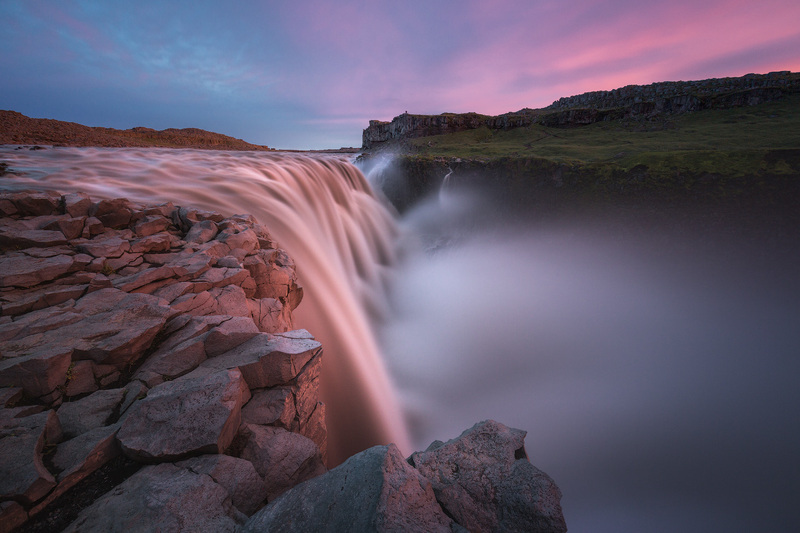 You will now head to the beautiful and remote Eastfjords of Iceland, but before you bid farewell to the North, you’ll make a stop at a stunning and dramatic cascade, Dettifoss, Europe’s most powerful waterfall. You're sure to be in awe, watching the glacial water tumble 45 metres down a cliff, the loud rumbling surrounding you, the spray from the fall misting your face before crashing at the bottom. You can capture this fantastic scene on film. You’ll continue through the highland desert and drive through a mountain pass before reaching the gorgeous Eastfjords in the realm of the Vatnajökull glacier. Here you’ll find countless fjords, beautiful mountains, clear streams, bird cliffs, waterfalls, and charming fishing villages. You will also have the chance to visit and photograph the waterfall Rjúkandi, a layered cascade that descends the steep valley of Jökuldalur which was carved by a glacial river. The surrounding area will be cloaked in the beautiful, vibrant colours of autumn. You will spend the night in one of the lovely towns of the Eastfjords, Djúpivogur. Today, you’ll travel through the farmlands of the Eastfjords, zigzagging the coastline south while the majestic Vatnajökull glacier watches over you. 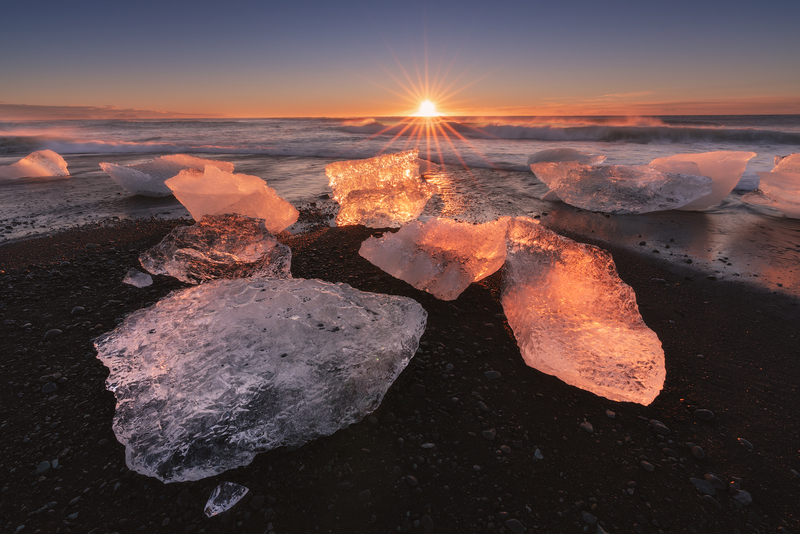 Your destination is the stunning Jökulsárlón Glacier Lagoon where you’ll spend the next three days with your camera, photographing this incredible region. Jökulsárlón is in the Vatnajökull National Park area which has a unique beauty and offers a wide range of natural wonders. You’ll get to explore and photograph white glaciers and black volcanic deserts using the season’s fading light to create some out-of-this-world photos. At the glacier lagoon itself, you’ll see enormous blue icebergs that have broken off the nearby glacier tongue, floating in a serene lake before they drift off to sea. If you are lucky, you might see a seal or two swimming in the lagoon or lazing on the bergs. Your next three nights will be spent at accommodations in this beautiful area. 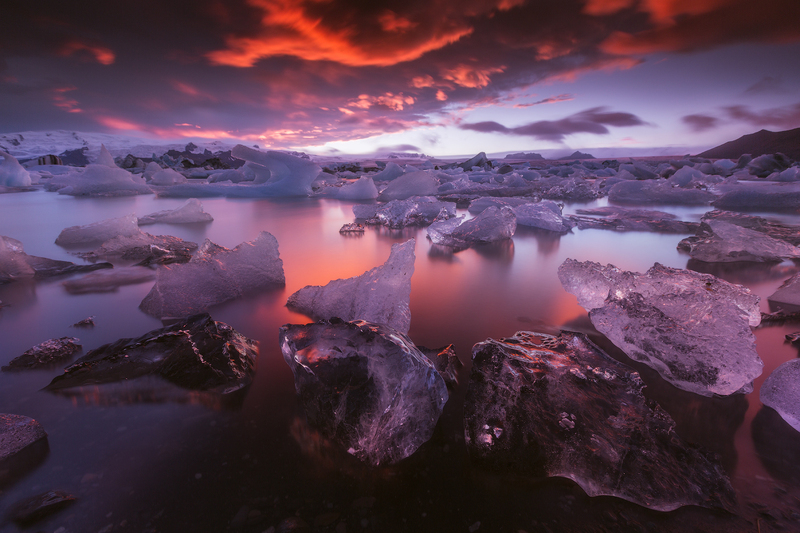 Today, you’ll explore the Jökulsárlón glacier lagoon further. You’ll start the day early so you can capture the sunrise as it illuminates the icebergs in the lagoon. From there, you’ll walk over a nearby black sand beach. Icebergs from the lagoon sometimes wash up on shore. They rest atop the black sand and glisten in the sunlight, like precious stones on a satin blanket. The beach has earned the nickname ‘The Diamond Beach’. 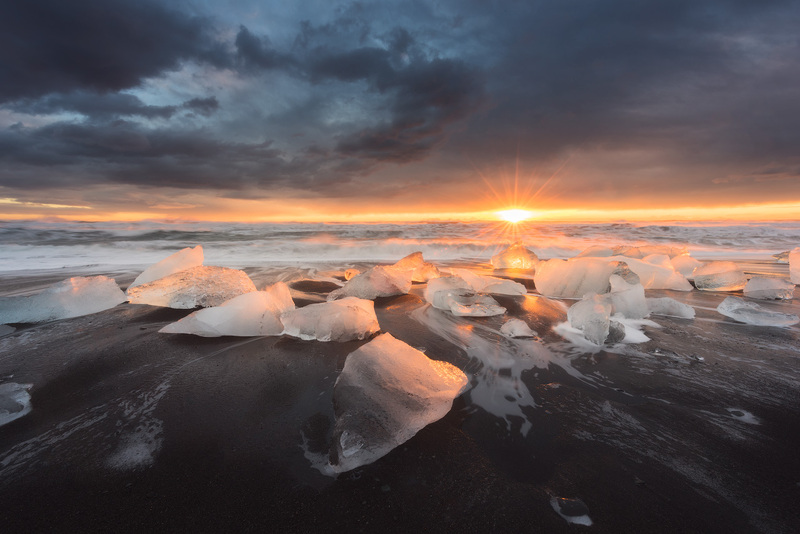 The beach is a great place to play with composition and to try to capture the clear ice, the black sand, the ocean’s waves and the sunlight. 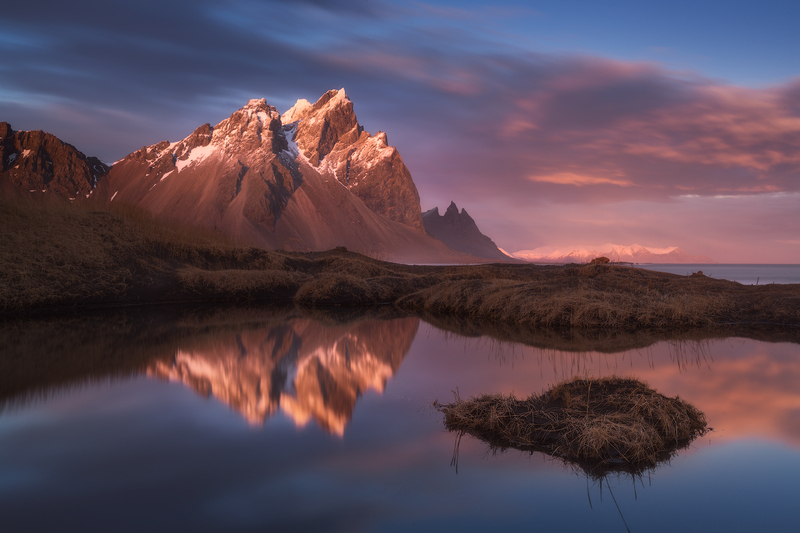 Your time in Vatnajökull National Park will not only be spent photographing icy scenes; you’ll also have the opportunity to capture the beautiful Stokksnes beach and the majestic Vestrahorn Mountain as well. The jagged, isolated mountain combined with the black sands make for a rough but beautiful setting for today’s photographs. The mountain’s dramatic slopes, the waves of the Atlantic Ocean and the plethora of birds flying above give the whole scene a wild look. You will spend the day chasing the sunlight and capturing the majestic mountains from various angles before returning to your accommodations in the Jökulsárlón area. Now it is time to leave Jökulsárlón and Vatnajökull National Park behind and start exploring some of the diverse attractions of Iceland’s South Coast, beginning with the charming village of Vík. Although the idyllic village is very photogenic, your focus today will be on the nearby Reynisfjara beach where you can capture the roaring waves of the Atlantic Ocean as they crash on the black shore. Reynisfjara is surrounded by columnar cliffs which are comprised of dark volcanic rock, and out of the ocean rise the impressive basalt sea stacks, Reynisdrangar. 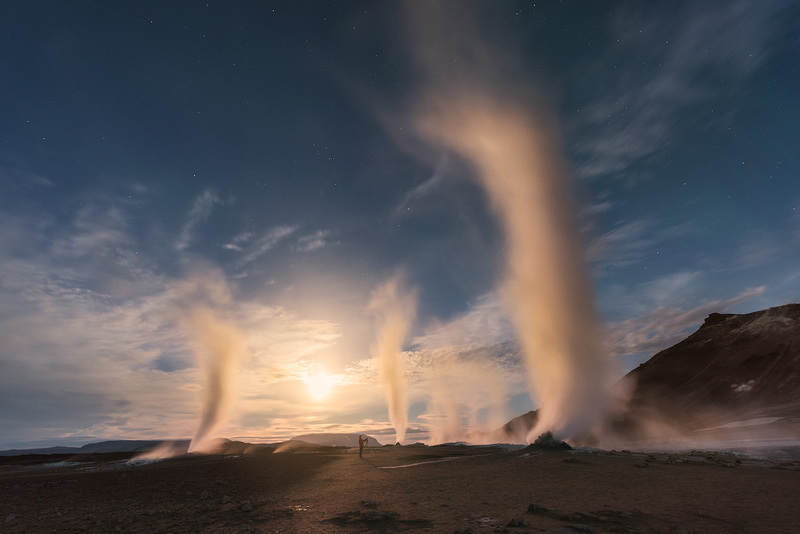 The eerie sea stacks, breathtaking cliffs, dark sand and crashing waves at Reynisfjara make for some dramatic photographs, and you will spend the day capturing the light at different locations on the beach before making your way to your accommodations in Vík. Today, you’ll make your way back to Reykjavík city, but not before stopping at some of the South Coast’s most iconic attractions. 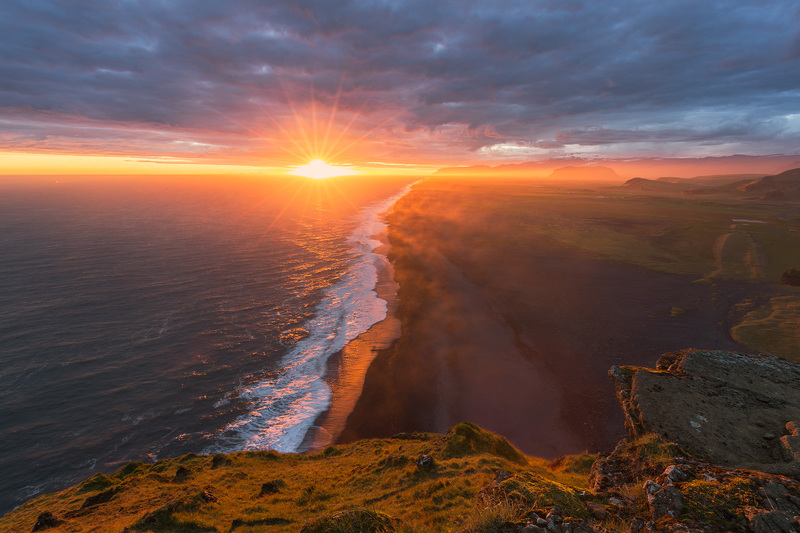 After a hearty breakfast, you will set out from the village of Vík to the nearby Dyrhólaey peninsula. 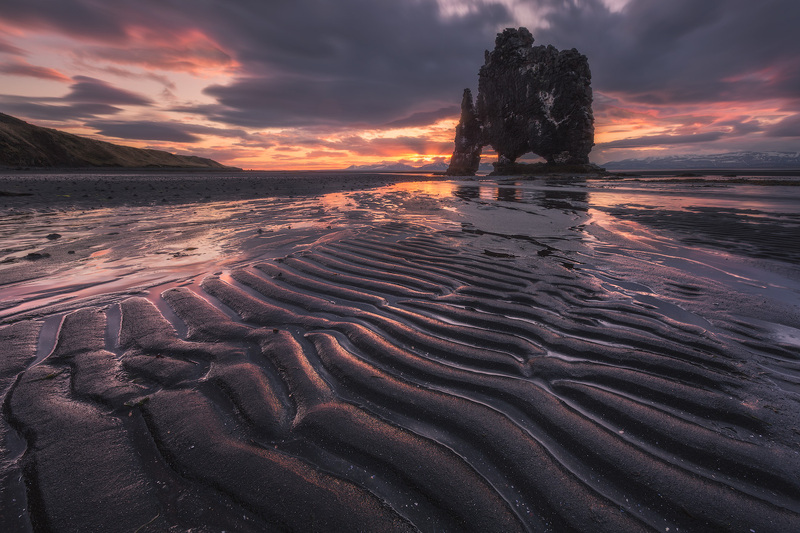 Here you will get another view of the towering Reynisdrangar sea stacks, as well as a rock arch that's been carved out by the ocean’s waves, much like the one near Arnarstapi you visited just a few days ago. 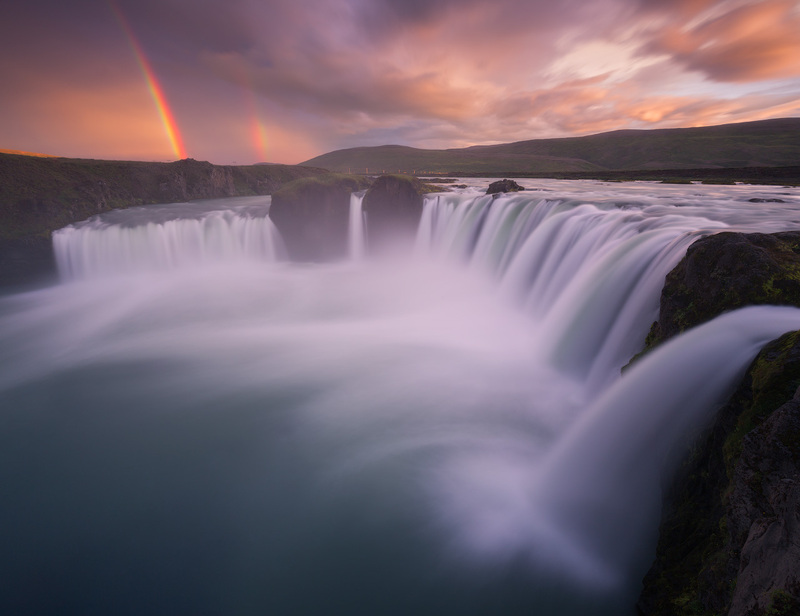 You’ll then continue your journey west, passing two majestic glaciers, Mýrdalsjökull and Eyjafjallajökull, before stopping at a beautiful cascade, Skógafoss. 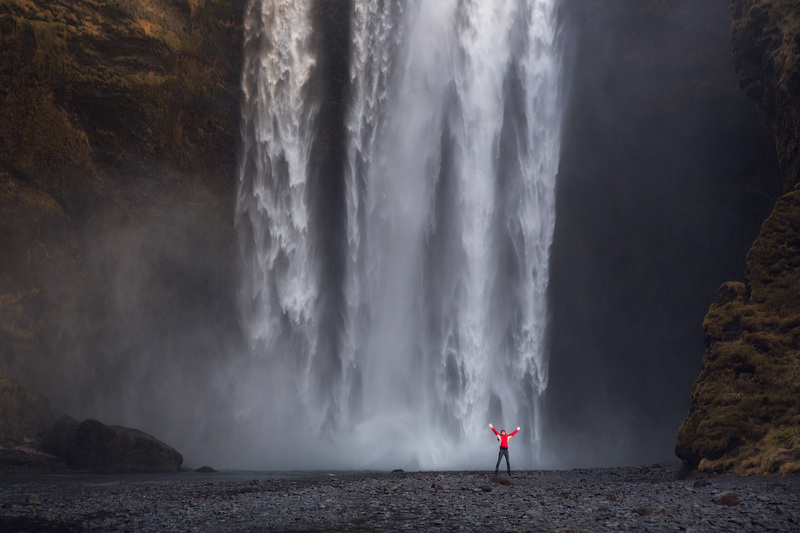 This is one of the biggest waterfalls in Iceland, with a 60-metre drop. The land underneath is very flat, so when the water hits it, the cloud of spray is enormous; in sunny weather, it creates a beautiful rainbow. From there, you’ll travel to another, equally impressive waterfall, Seljalandsfoss. The narrow stream of the cascade falls over a cave in which you can enter for a unique and unforgettable view of the nearby countryside. You will then head to your accommodations in Reykjavík where you will spend your last night in Iceland. Now's the time to bid farewell to Iceland. 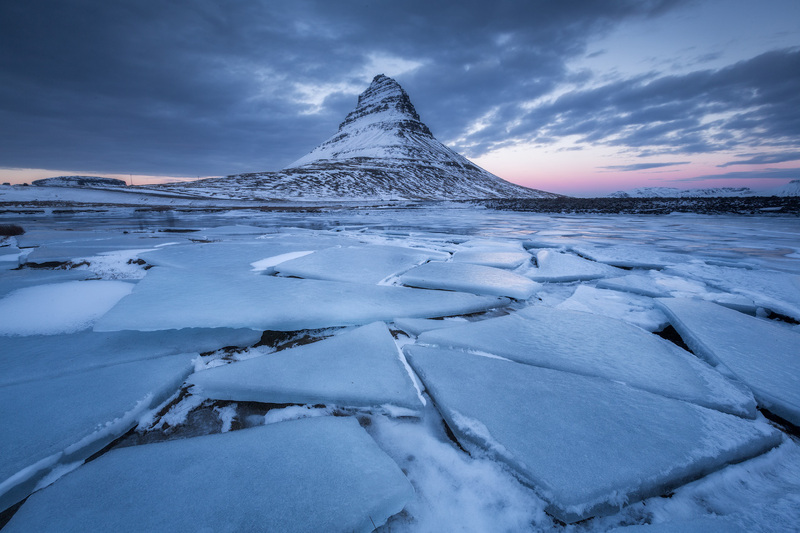 After your journey around the country, you'll have great memories of your time here in Iceland, as well as some spectacular photographs of the unique and beautiful nature found here. After breakfast, you'll board a bus that'll take you through the lava fields of Reykjanes Peninsula, to Keflavík International Airport. Have a great flight and come back soon.